In November 1939, some two months after Germany had invaded Poland, Grand Admiral Erich Raeder, head of the Kriegs­marine, in­structed a subordi­nate to draw up a paper on “the pos­si­bility of troop landings in Eng­land.” The study paper set out four pre­requi­sites. The next month the German Army, with input from the Kriegs­marine and the Luft­waffe, issued its own paper, also laying out four pre­req­uisites. The sub­stance of both papers presumed the success­ful elimi­na­tion of the Royal Air Force in English skies and the sealing off or the elimi­na­tion of the Royal Navy from English landing and approach areas before launching an invasion. Following Ger­many’s swift occu­pa­tion of the Netherlands, Belgium, and France in May and June 1940, and Adolf Hitler’s growing impa­tience with British indif­fer­ence toward his recent peace feelers, the Ger­man leader for­mally set in motion pre­para­tions for Opera­tion Sea Lion (Unter­nehmen See­loewe), the cross-Channel inva­sion of Eng­land from ports in the Low Countries. Sadly for Ger­many, the fail­ure of Hermann Goering’s Luft­waffe in August–Septem­ber 1940 to defeat the Royal Air Force, despite in­flicting punishing losses, con­vinced the Kriegs­marine’s high com­mand that the in­va­sion of England was too risky. Not being certain of the approaching win­ter weather, Hitler wisely de­cid­ed on this date in 1940 to post­pone the in­va­sion until a new date could be set. The Luft­waffe still had orders to con­tinue its attacks on Brit­ain. Instead of air­fields and other mili­tary instal­la­tions, the Luft­waffe now tar­geted indus­trial cen­ters and, finally, on Septem­ber 7, 1940, the city of London itself. This phase of the air war over Britain was called the Blitz (Septem­ber 7, 1940, to May 10, 1941) and was Hitler’s way of pun­ishing the Brit­ish for refusing to sur­render. Assisting the Luft­waffe in pun­ishing Eng­lish cities was a small con­tin­gent of Ital­ian fighters and bombers, the Ital­ian Air Corps (Corpo Aereo Itali­ano, or CAI), which over a 100‑day period had little to show for its effort, earning the mocking nick­name “The Chianti Raiders” whenever RAF pilots acted to intercept the incoming aircraft of Hitler’s Axis ally. The Battle of Brit­ain (July–October 1940)—the air war that was Opera­tion Sea Lion’s pre­landing phase—cost the Luft­waffe 1,733 planes against 915 Brit­ish fighters and took all the wind out of Sea Lion’s sails. Hitler’s am­bitions for domi­nating Europe now turned toward the Soviet Union, which was 2 years into a 10‑year non­aggres­sion pact (Molotov-Ribben­trop Pact) with an incor­rigible aggres­sor and shame­less back­stabber. Opera­tion Barba­rossa, launched on June 22, 1941, proved a fatal mis­take. In less than four years the capi­tal of Hitler’s Thou­sand-Year Reich, menaced on every side by Soviet land forces and over­head by Anglo-American bombers, had shrunk to a few hun­dred square yards, becoming the Nazi leader’s tomb on April 30, 1945. 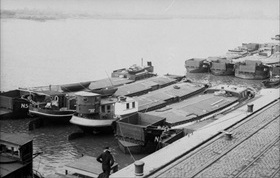 Left: Lacking purpose-built landing craft, the Kriegs­marine impro­vised with in­land freight barges in the lead-up to Opera­tion Sea Lion, as shown here at Wilhelms­haven, Germany, August 1940. Approxi­mately 2,400 barges were col­lected from all over Nazi-occupied Europe (half from the Nether­lands). Of these only about 800 were powered (some poorly); the rest had to be towed by tugs. 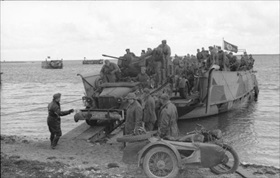 Converting the assembled river barges into landing craft for troops, tanks, and vehicles was compli­cated. Some barges could accom­mo­date three or four tanks. After Sea Lion was can­celled, the Kriegs­marine used some of the moto­rized barges for landing on Soviet-held Baltic islands but most were returned to their former service. Right: In the late 1930s the Kriegsmarine ordered the develop­ment of pur­pose-built landing craft, which were tested in the Baltic Sea begin­ning in March 1941. Not until Septem­ber 1941, a year after Sea Lion was can­celled, was the first in a series of landing craft, the Pionier­landungs­boot 39 shown here, avail­able for service. Excepting the last in the series, the landing craft were assembled from two mir­rored pieces, which could be trans­ported by rail to the coast or river entry. The Pionier­landungs­boot 39 was nearly 50 ft long and 15 ft wide and cap­able of carrying 20 tons. It was first used during Opera­tion Bar­ba­rossa, Hitler’s inva­sion of the Soviet Union. The largest and last in the series of landing craft, the Pionier­landungs­boot 43, was 116 ft long, 28 ft wide, and could carry 95 tons of cargo. 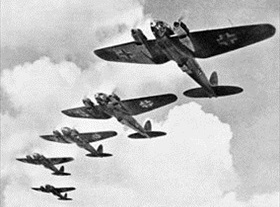 Left: German bombers (He 111s) over Britain. From the per­spec­tive of Ger­many, the fifteen weeks of aerial com­bat known as the Battle of Brit­ain (July–October 1940) was an attempt to whittle away at the Royal Air Force, there­by giving the Luft­waffe air supe­ri­ority during Opera­tion Sea Lion. Stymied by the RAF on the one side and by their own lack of com­bined opera­tional com­mand on the other, the Ger­mans switched from bombing mili­tary com­plexes to bombing cen­ters of indus­try and popu­lation, inadver­tently per­mitting the RAF to regroup and replace its lost aircraft and installations. Right: The first heavy bombing of London’s docks came on the night of Septem­ber 7, 1940 (“Black Satur­day”), which was the start date for the London Blitz. The huge pall of smoke bil­lowing from river­side ware­houses and docks could be seen for miles. 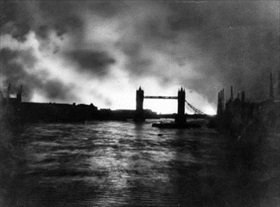 Fires raged right up to Tower Bridge. Like the Battle of Brit­ain, the Blitz never achieved its in­tended goals of either demor­al­izing Brit­ish poli­tical and mili­tary leaders into capit­u­la­tion or signi­fi­cantly damaging the coun­try’s eco­nomy to con­tinue the war. (Over its nine months, the Blitz killed more than 43,000 civil­ians.) By the time the last bombs had fallen on Lon­don on May 10, 1941, in a par­tic­u­larly murderous cli­max to the Blitz, the inva­sion threat had passed, and Hitler’s atten­tion was directed eastwards to the Soviet Union.